I have been doing research on Options and thus far most of it has been relatively theoretical (mainly pricing models and put/call hedging strategies). Recently I have been looking into actually buying options contracts and I am very confused. I had assumed that with options you could go to a website that quotes financial instruments and it would give you the strike price, premium/(initial cost of buying the option) and the expiration date. Can someone please explain how to equate the values in the tables above into strike price and premium/(initial cost of buying the option) ? This is exactly how I started, starting a simulation account on the CBOE website just to see what situation was profitable because it was all greek to me. Actually after learning the greeks, I realize that site was worse and eventually read some books and got better tools. The screenshot you have is telling you the strikes, but unfortunately they are showing you the technical name of the contract on the exchanges. For example, just like you type in AAPL to buy shares of AAPL stock, you can type in VIX1616K16E to get that one particular contract, expiration and strike. So knowing that in the money options will be more expensive, and near the money options will be slightly cheaper, and out the money will be even cheaper, you can see what is going on, per expiration. Not the answer you're looking for? 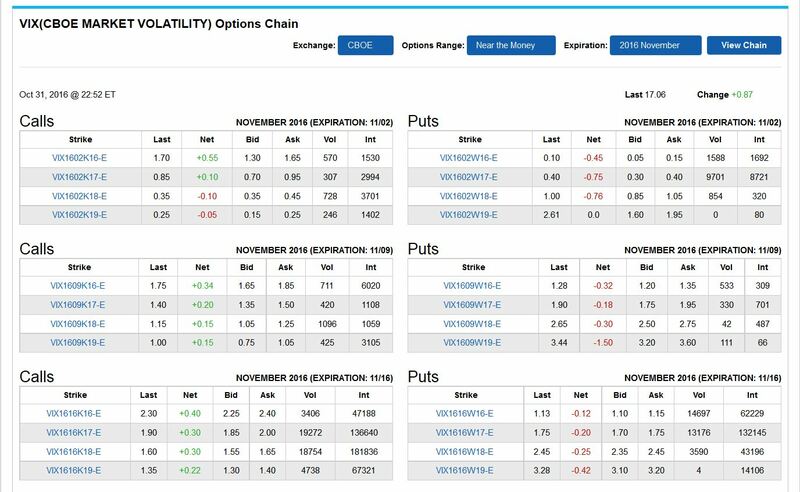 Browse other questions tagged stocks options derivatives hedging volatility or ask your own question. Why are so few options ever actually exercised? Total price of (AAPL option strike price + option cost) decreases with strike price. Why? Why don't options exchanges allow limit orders to include delta?